January, puts his beloved Chevrolet, purchased used as a country car in 1961, “out to pasture.” It has become too expensive to maintain, but he keeps it on the Amagansett property, rusting away. Steinberg’s Chevrolet, out to pasture on the Amagansett property. February 17-25, trip to Guadeloupe with Sigrid; initially reluctant to visit a tourist site, but then finds it a “paradise.” They return in the winters of 1986 and 1989. 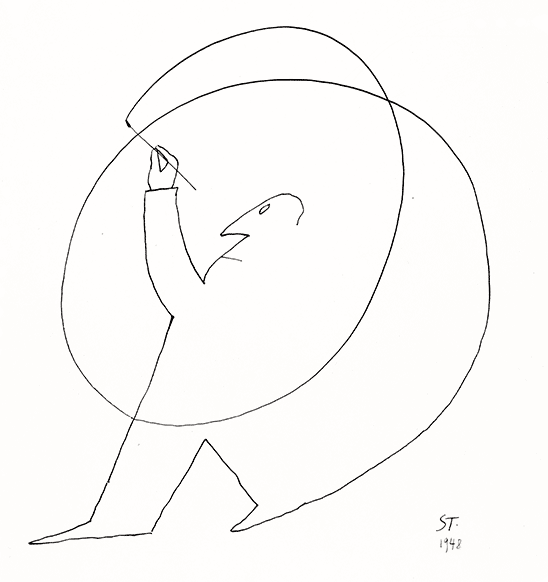 October, “Saul Steinberg/Richard Lindner,” Galerie Maeght, Paris; catalogue introduction by Eugene Ionesco. Around this time, meets New Yorker writer Ian Frazier, who becomes a close friend.